Toddlers and young children love to explore their world by putting things in their mouths. While ingestions (putting something in your mouth) is most often the route of a poisoning, there are other ways that people can be overcome by a poisonous substance as well. For example, carbon monoxide is an odorless and colorless gas that is breathed into the system and can cause death. Poisonous products can be found in many places in the home, the garage, the yard, the car and our general environment. In the past, we often thought of a poisoning happening from dish detergents, toilet bowl cleaner, bleach of other ï¿½hazardousï¿½ products. You might be surprised to learn that today, medications are one of the leading causes of unintentional poisonings in children. Vitamins, over-the-counter and prescription medications, things we have in our home to keep us healthy of make us feel better are actually causing poisonings to children. We have many resources that will assist in increasing your knowledge about medication and poisonous products. Another helpful resource offered by the N.D. Department of Health is a Poison Safety Brochure. The Office of the North Dakota Attorney General has created a Drug Take Back Program across the state of North Dakota and Minnesota has one that is similar. These programs are designed to get unwanted or unused medications out of the homes. 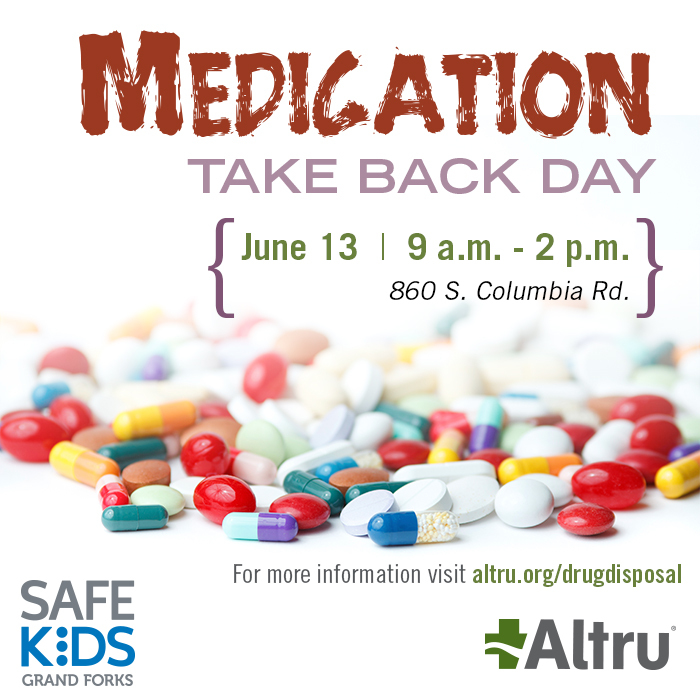 The take back sites are found in law enforcement centers across the states and people can simply bring their medications (over-the-counter or prescription) to the drop boxes located at these facilities. If people are not able to drop off items at these locations, we would encourage them to dispose of their medications in used (wet) coffee grounds or moistened saw dust rather than flushing them down the toilet. All events will be from 9am-2pm. The National Poison Control Center is a leading expert in poisonings and they have resources set up across the country to respond in the case of an emergency or for general questions on how to keep your home safe from poisonous products. Click on their logo to be directed to their web site. For free copies of the Poison Control Center number in stickers or magnets, contact Safe Kids Grand Forks and we would be happy to provide them.